Sitecore Digital Marketing Suite unifies web content management, analytics and marketing automation for faster conversions. You’ll be able to easily track and understand the impact of your Digital campaigns, develop profiles, personalize content dynamically and take action with analytics immediately. 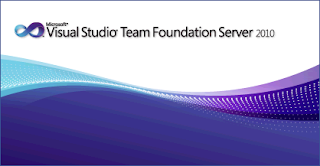 This breakthrough solution enables your team to get better results without the complexity, time and costs of multiple third party tools. • Which search engines did the visitor use? • What Network location did the hit come from? • What hostname did the visitor hit? • Which search words did the visitor search for, when coming to my site? • How many page hits have I had? • How many unique visitors have I had? • Which countries/cities do my visitors come from? 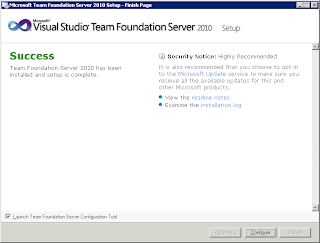 • What sites are referring my site and therefore generating visitors for me? 1. 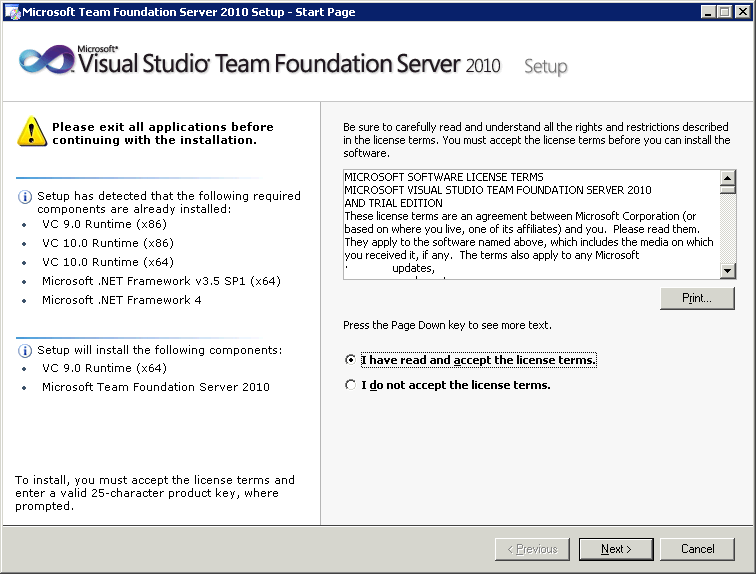 Unzip the package: DMS_2.0.0_rev._110818.zip. 2. 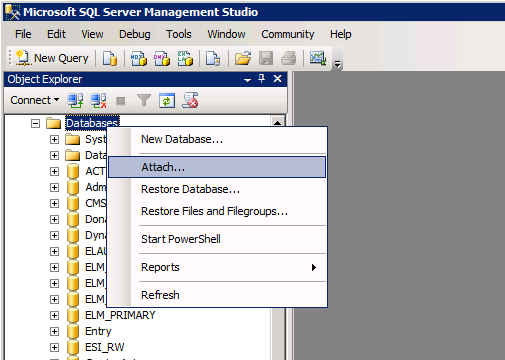 Open SQL Server Management Studio, right click Databases, and click Attach. 3. Attach window opens, click add. 4. 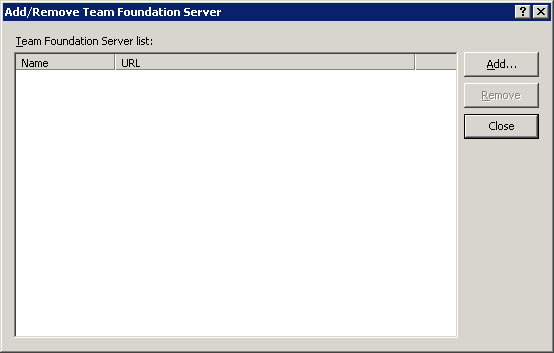 Click Add, and locate the MDF file. 5. 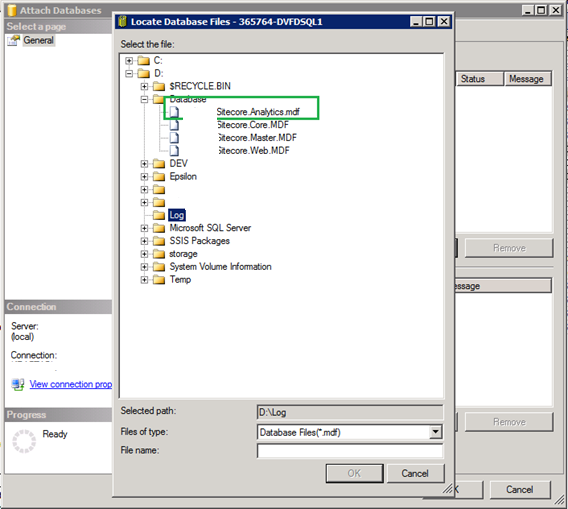 Locate LDF file and click ok.
6. 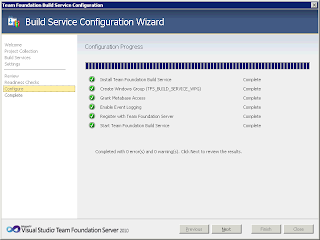 Add Connection string entry in web.config. 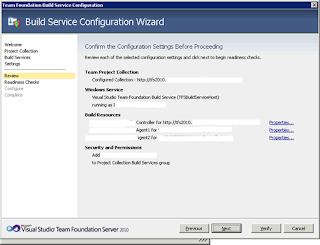 Open web root folder of Sitecore (<WebsitePath>\Website\App_Config), edit connectionstrings.config using notepad. Add the connection as mentioned below. 7. 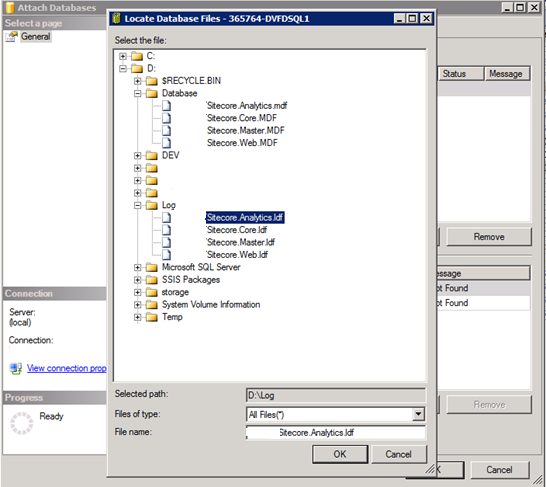 Copy Sitecore.Analytics.config and Sitecore.Analytics.ExlcudeRobots.config file to the /App_Config/Include/ folder. 8. 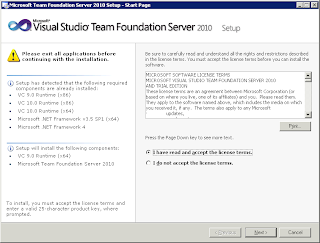 Modify existing layouts and put in a <sc:VisitorIdentification runat="server"/> Web control in the <head> block to enable automatic robot detection. 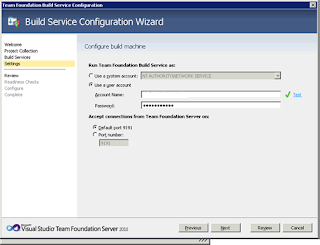 Team Foundation server, a powerful source control as of today, needs a build machine where we can setup build controllers and agents to build solutions and projects. We can have either physical machine or a virtual machine as the build machine. 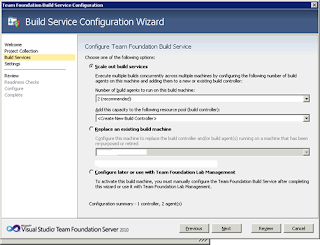 We can setup a single build controller or one or more build agent or one build controller and a build agent in the build machine. 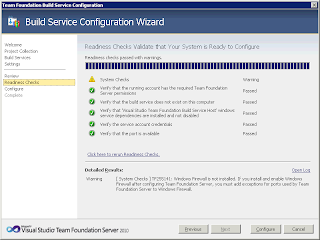 Following are requirements and server settings for installing TFS 2010 Build service based on the installation done on the servers. 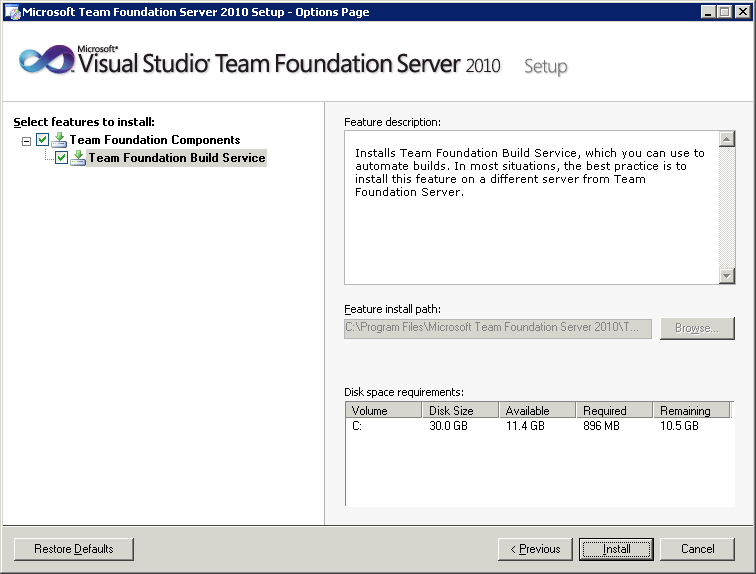 Given below are the Hardware requirements. 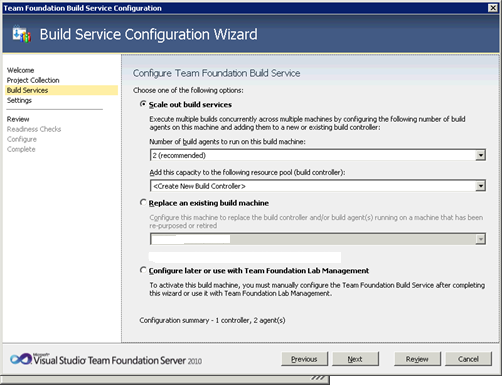 As it the build process, build machine needs to have better performance. 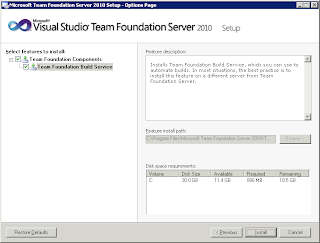 Please have the TFS 2010 Build service installable. 2. Accept the agreement and click next. 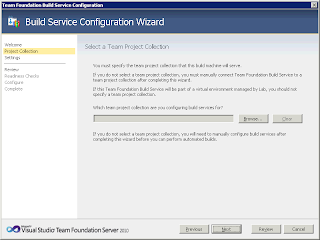 Select Team Foundation Build Service and click Install. 3. Installation is complete. 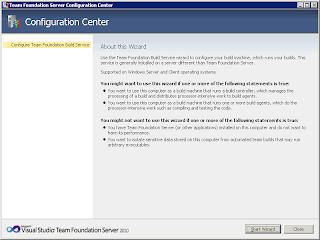 Check Launch Team Foundation Configuration Tool and click configure. 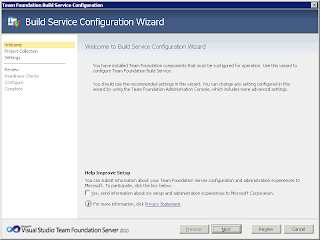 Please wait for the configuration windows to appear. 2. 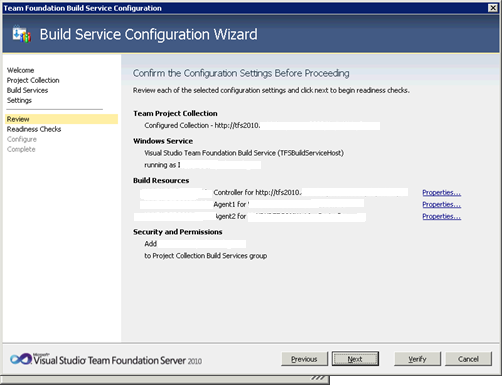 Click on Start Wizard. 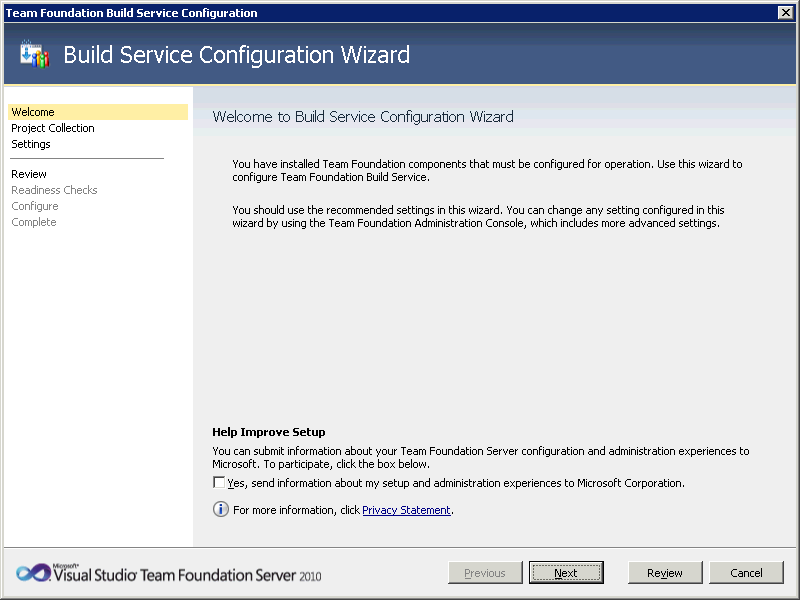 This will start the configuration wizard to configure the TFS Build service. 4. Click Browse to select the TFS Team Project Location. 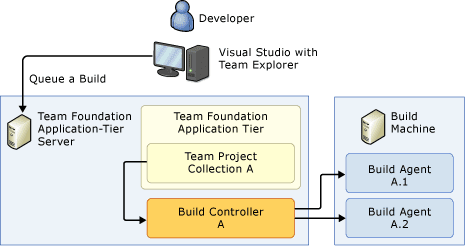 Click Servers, then Click Add and enter the url for Team Project. 6. 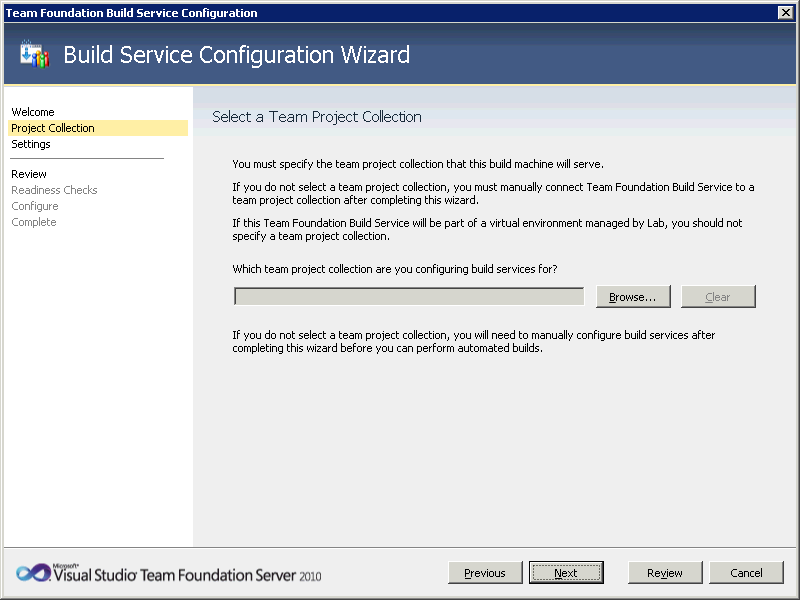 Select Scale Out Build Service. 7. 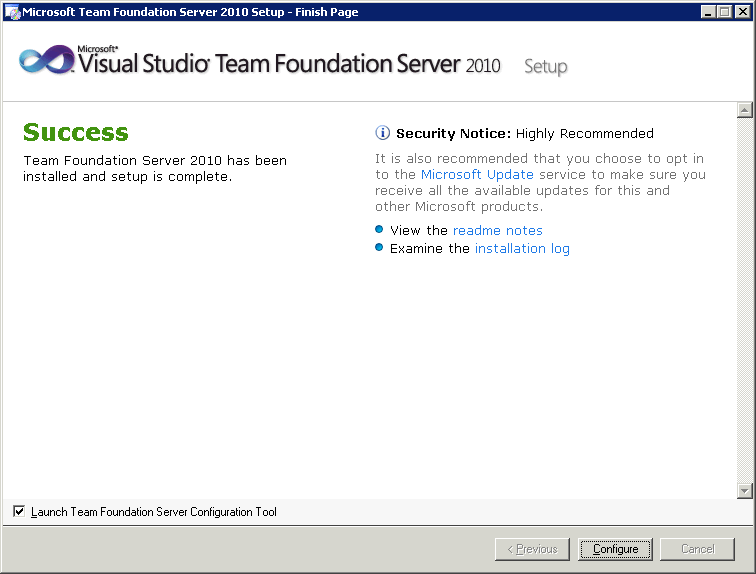 Please provide the domain ID so that it can access TFS 2010 location and click next. 9. 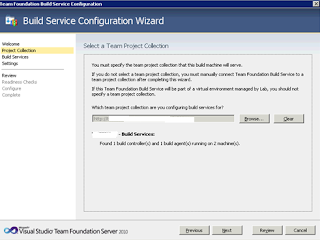 Click Verify to check the configuration review. 10. 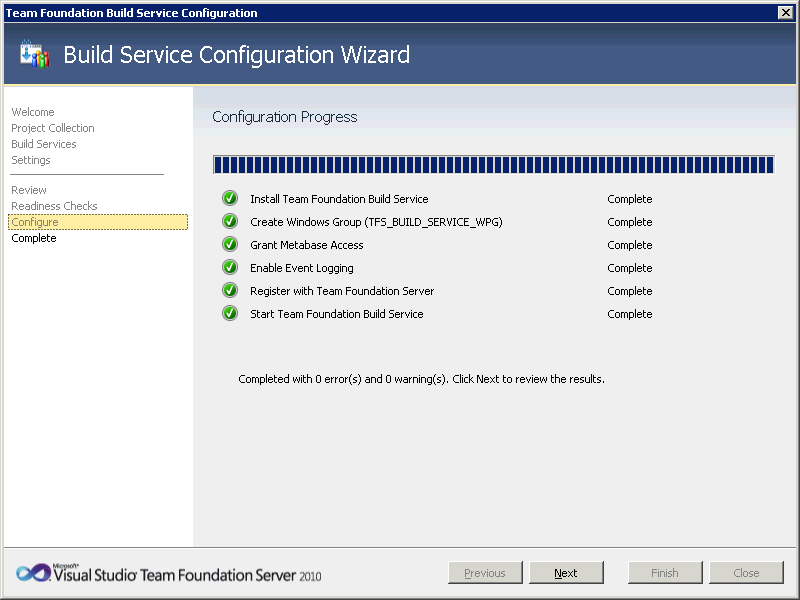 Click Configure. 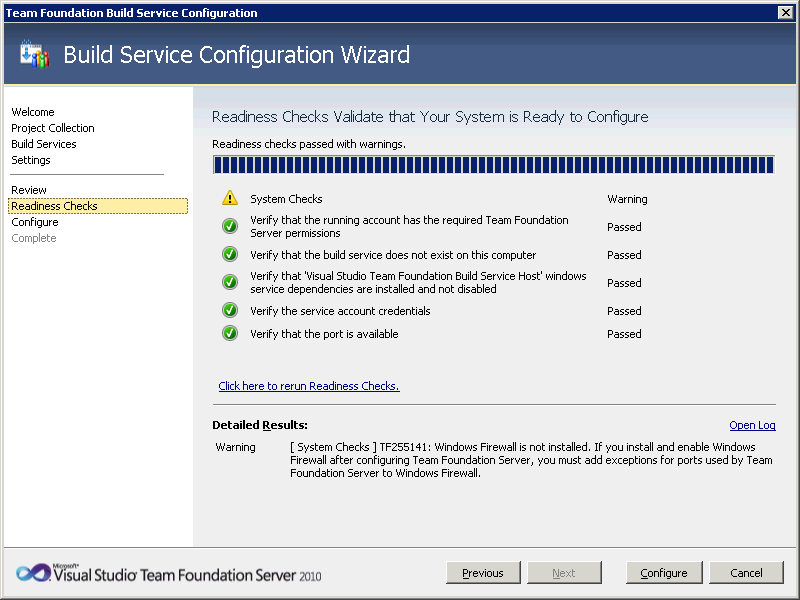 Installations is done and click next. 11. 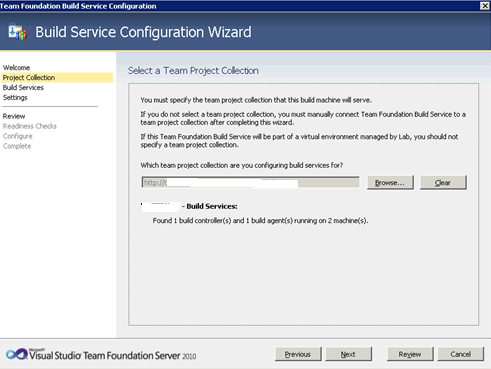 Configuration is done. Click Close. 12. 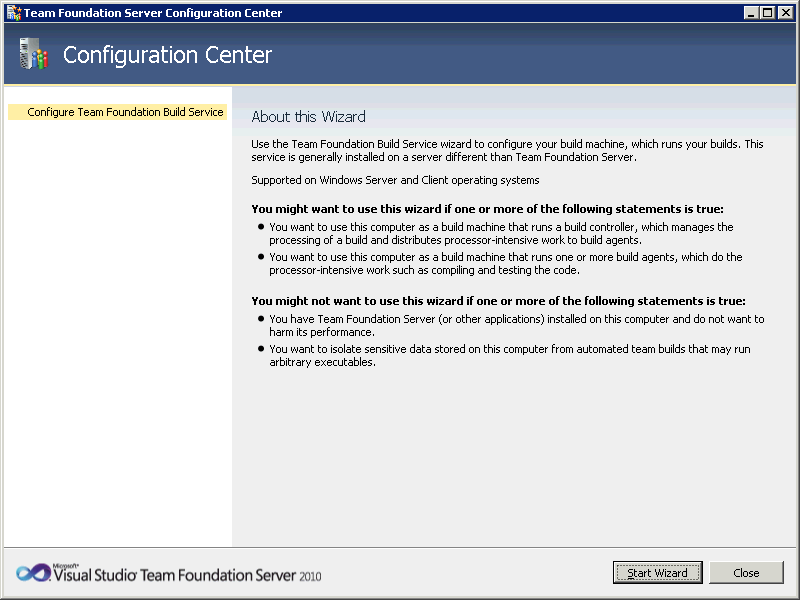 TFS Administration Console will open and it will show the Controller name and the agents which are associated with it. 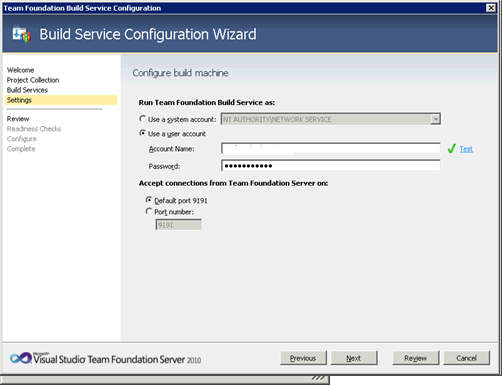 We can use the controller to setup build automation using TFS.